When it comes to flying drones, most of them can be controlled by conventional RC. However, in today’s age of smartphones, there are few models available that can be controlled using a smartphone. It is definitely an amazing news for drone enthusiasts who can choose to make the most out of their flying machines by this new controlling mechanism. Though not high-end drones can be controlled this way, many top-class devices can be controlled using a smartphone app over a Wi-Fi or Bluetooth connection. Let’s have a look at some of the leading drones that come under this category. The company, Parrot has always been known for its ground-breaking ideas that deliver enhanced user experience. These drones are true performers by offering great features and amazing control settings. Most of these drones can be flown using your smartphone. However, if you need more, you can get the controller from them. The latest Bebop 2 is a feature-loaded quadcopter that comes with a range of autonomous flying modes and a pretty decent camera. For smartphone usage, there is an app called FreeFlight 3 that lets you control the basic functions of Bebop 2. 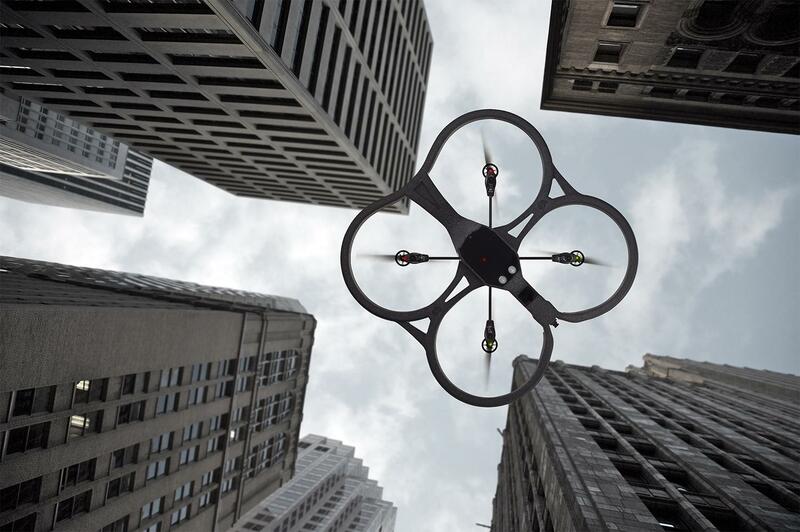 The brand name has become synonyms to excitement in the eyes of drone lovers. Their products are poised to infuse fun & excitement and one of them is the Prove version of H501S. Though it comes with an advanced controller & FPV video screen, flyers can control this drone using a smartphone app. Alike other Husban drones, this device exhibits excellent compatibility with smartphones and tops the chart in the category. Attuned with VR goggles, this is another amazing FPV flyer. Presenting control access using remote or smartphone, the DBPower UDI U818A is a bit fewer powerful compared to U842 but delivers a smoother experience in the form of enhanced aerial footage. The live video stream works up to 100 feet away and can be easily viewed on a smartphone, just place your phone in the holder on the remote control for easy usage. The device acts both as a car and a quadcopter. Yes, it is true. The MiniDrone Rolling Spider features big wheels that can spin along, delivering a new level of fun in regard to indoor flying. Though these wheels are now powered ones, they provide complete safety to drone by protecting it in close situations. The device comes with an inbuilt camera and can easily be controlled using a smartphone app. Sphero BB-8 is a strongly built drone that can even take a few knocks. It is actually a fictional drone set to appear in the seventh Star Wars movie. Created by Orbotix, the company famed for Sphero, BB-8 is designed for entertainment purposes and has no discernible educational characteristics. You can choose to have fun with these amazing devices using your smartphone.